It’s hard for me to stay focused while writing. Sometimes I feel like there’s a perception on social media that I have my writing act together – which isn’t always true. While I do make an effort to concentrate when I’m working on something, it’s not guaranteed to happen. Sometimes the shiny lure of the internet is too strong to resist. I wrote a similar post ages ago, but I’ve learned a lot since then. It’s time for an update. I want to share with you what works for me now, in hopes that you might find something that works for you, too. After a lot of trial and error, I’ve discovered some resources that help me stay focused. Write or Die. If you haven’t heard of Write or Die, check it out immediately. I’ve written some posts about it, but I’m not sure I’ve give you my settings yet. What works for me is setting the word count goal to 500 and the time limit to 30 minutes. You should experiment ad see what works best for you. Fullscreen mode. Whether you’re writing in Scrivener, Word, or some other program, going fullscreen is a great way to block out distractions and keep you focused on the task at hand. Ava Jae wrote a post about this technique. My laptop’s wireless button. Sometimes, the simplest solution is the most effective. If you just can’t bring yourself to stay off the internet, turn off your switch or your router for a while. Music and headphones. When I hear kids playing outside or my apartment is too quiet, I plug in my headphones and put some music on low in order to get in the zone. If you’re not a music person (first of all, how? ), try a webapp like Coffitivity or focus@will. StayFocusd. I used to use this Chrome extension in college, but it’s been a while since I tried it again. Last night, I downloaded it and gave it a whirl. I’ve got to say, it’s just as great as I remember. Since I use social media for my job, I set the program to run from 5 p.m. when I get off work to 8 a.m. when I go into work. It lets me browse my blocked sites (Tumblr, Twitter, Pinterest, etc.) for 30 minutes before telling me to get back to work. There’s also a nuclear option if you want to block sites on the weekend or whatever, for a set amount of time. Give it a try. 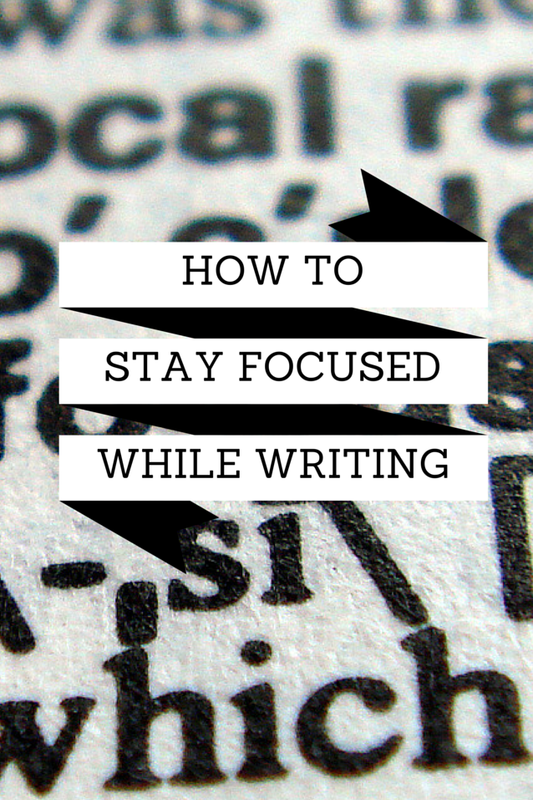 I’m constantly on the lookout for more tips and tricks to keep me focused while writing. As I discover new methods for staying productive, you can count on me to share them with all of you here. While the methods in this post won’t work for everyone, I encourage you to try them out to find what works for you. What are some tips, techniques, and resources that help you stay focused while writing?